Performed by the FOD Band brings to the stage the magical hits of these two legendary harmony bands. Bringing back memories of the most high energy decade in pop music history. Let the haunting melodies transport you to that exciting era when millions of records were sold. The Searchers, from Liverpool, made their debut with the rise of MerseyBeat. Their very first recording, ‘Sweets For My Sweet’ ` went to number 1. This was followed at No.2 by their third single, ` Sugar And Spice.’ They then went on to have many more memorable chart hits. Who can forget ‘Needles And Pins’ and `’When You Walk In The Room’. They had many other hits and became part of the British invasion of the American charts alongside The Beatles. The Hollies, from Manchester, were also pushed forward with the rise of MerseyBeat as they played many of the same venues as the Mersey groups . The Hollies are known as the most successful British singles band ever – having had chart hits in every decade since the `60`’s. Catchy, melodic tunes are their trademark and they have had phenomenal chart success. ‘Stay’, ‘I Can’t Let Go’ , ‘Bus Stop’, ‘Sorry Suzanne’, ‘He Ain’t Heavy He’s My Brother’, ‘Here I go Again’, ‘Just One Look’ and the haunting ‘Air That I Breathe’ are just a few of their hits. The FOD Band. 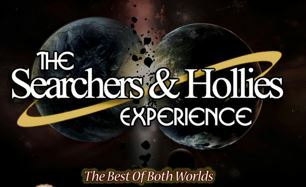 The Searchers and Hollies Experience is performed by the FOD Band who have been together since 1983. They have a particular insight into the Searchers music having backed Tony Jackson, the original lead singer of The Searchers. When Tony Jackson returned to performing in the 90`s, The FOD Band were selected by Tony to back him under ` The Tony Jackson Group ` banner. The FOD Band have also appeared with Eric Haydock’s Hollies, a band that Eric Haydock, the original Hollies bass guitarist formed in the 1990`’s. FOD love the harmonies and the melodic material these groups recorded, and this is what motivated them to combine the two group’s hits into this exciting 2 hour show – featuring over 30 hit songs. It is an incredible back catalogue of hits. It is a show guaranteed to have you in ‘Needles and Pins’ with nostalgia as soon as you ‘Walk in the room’ .It is definitely worth ‘Just one look’ and you will say ‘Here I go Again’ I feel that `I’m Alive` when hearing these melodic hits. So if you are thinking about booking tickets just say ‘Yes I will’ after all you do not want to be saying ‘I’m sorry Suzanne‘ I missed it! Benefit from discounted rates on fitness classes, reduced rate at the bar and much, much more! Adult membership only £40 p/year.